REHABILITACIÓN Y MEDICINA FÍSICA. Mirando al futuro. : Guitar Hero III usado para mejorar el desarrollo de prótesis. Guitar Hero III usado para mejorar el desarrollo de prótesis. Investigadores utilizan el videojuego Guitar Hero para mejorar el desarrollo de un brazo protésico. Forman parte del equipo del Applied Physics Laboratory’s (APL) National Security Technology Department de la John Hopkins University. A pair of engineers at the Applied Physics Laboratory’s (APL) National Security Technology Department at John Hopkins University are using Activision's Guitar Hero III: Legends of Rock for Nintendo Wii as part of their work in developing an innovative prosthetic arm. Bobby Armiger and Jacob Vogelstein have rewired the game’s controller giving amputees a chance to rock out while testing out their latest prosthetic prototypes. Their research falls within the APL-led Revolutionizing Prosthetics 2009 project, funded by the Defense Advanced Research Projects Agency. The project’s mission is to develop a prosthetic arm that will be controlled and also feel, look and perform like a natural limb. This detection process is similar to training voice-recognition software but rather than analyzing tones, the APL system records and classifies muscle twitches. Traditional methods of calibrating mechanical limbs to recognize and respond properly to electrical signals in residual muscles are an exhausting and draining process, explains Armiger. That is where Guitar Hero comes in. The idea of using the video game came to Armiger while he was playing Guitar Hero at a party. Armiger and Vogelstein modified the game controller to have it be controlled by the team’s Virtual Integration Environment, an animated on-screen arm that mimics a patient's intended movements in real time. Button clicks are substituted with muscle contraction signals as picked up by the electrodes attached to the patient’s residual muscles, allowing him to play the game despite limited dexterity. 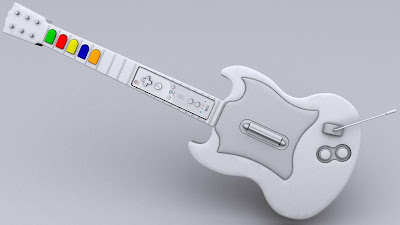 According to the pair, using Guitar Hero has proven a far more intuitive way to speed up the tiresome calibration process while at the same time making it fun for patients. "It allows for large numbers of rapid, dynamic movements that are more natural and not stereotyped," said Vogelstein. "Ultimately we are going to get more input and longer training cycles out of patients — and that will translate to better and more natural limb control." Eventually the team hopes to make its software open source so that others can repurpose games for rehabilitation. Publicado por Unknown en 10/20/2009 08:15:00 a. m.